Mix it up and try a new style AT these Summer Holiday workshops! 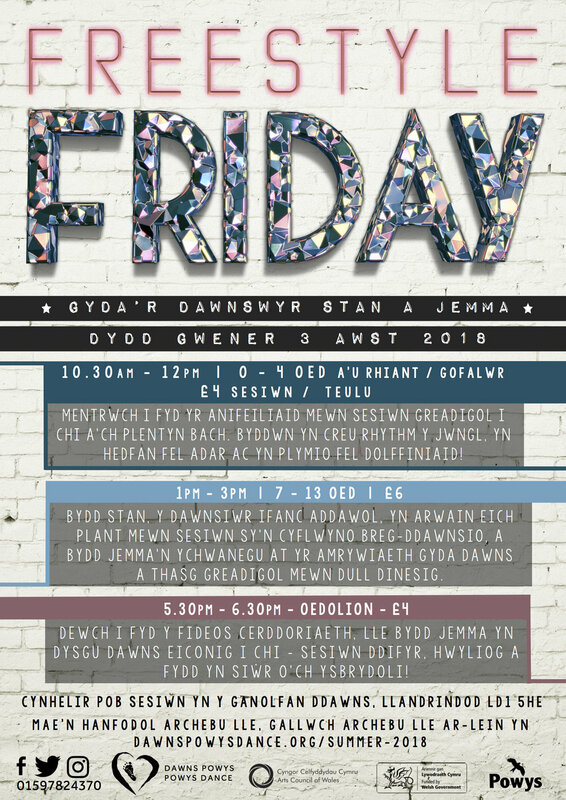 Freestyle Friday will delight all ages as we present a mix of dance styles which will include dance and craft for the under 4’s, break and urban dancing for 7 - 13 years and an adult dance session for anyone wishing to escape the house for an hour of full on fun dancing! Local breakdancer, and new to the Powys Dance team, Stan and popular dance teacher Jemma take the lead on Freestyle Friday ensuring the best possible experience for you or your little ones! It’s all about animals in this creative session for you and your little one. We’ll explore the rhythm of the jungle, fly like birds and dive like dolphins! Dance, play, music, stories, craft and snacks! All children must be accompanied by an adult, this session is for you to enjoy together. Breakdance and Urban workshop for 7 - 13 years. Budding young dancer Stan will guide your youngsters in a breakdance introductory session and Jemma will complement this by with an urban style routine and fun creative task! Adult Dance workshop, come and grab a fun and uplifting hour in the studio! Music Video madness will ensue in this workshop, Jemma will teach an iconic dance routine to delight, inspire and have fun! Stan started his dance career with Jemma at The Dance Centre in Llandrindod Wells. He moved on to breaking in 2015 having lessons with Bgirl Rosa in Aberystwyth. Since then he has had lessons with many Top UK and International Bboys including Boost, Didge, Mouse, LB, Poe One, Bruce Wayne, Thesis, Sunni and many more. He is leading the UK Breaking League for his age group but his ultimate goal is to become Red Bull BC One World Champion. He loves sharing his knowledge and passion for breaking and is looking forward to working with Jemma and Powys Dance this summer.
" I have always loved to dance, experiment and push myself and my body to try new things. That's what I love most about breaking, that freedom to experiment and challenge yourself is just the best feeling! Plus you get to create your own dance persona which is fun, it's playful creative and cool and I can't wait to have the opportunity to ignite that passion in young dancers this Summer!" Jemma has been a dance practitioner with Powys Dance for 8 years and in that time she has been passionate about making dance fun and accessible to as many people as possible. Being creative, learning technique, upbeat dance routines, exploration on a theme, she loves it all, and is so enthused when it comes to the endless possibilities of dance. She is dedicated to her participants and supports them through whatever avenue they choose to take with dance. ‘For me it’s all about having a good time, I want people to first and foremost enjoy dancing, then if they want to take their dancing further I am with them all away, but if they just fancy an uplifting hour in the week to have a boogie, I’m also right by their side!